The Colour Balance Project gathers together Dr. Lorna Roth’s extensive studies into the representations of skin colour. These studies address how the colour – or colours – of skin have been historically imagined, embedded, and manipulated in consumer products and through communications media. Through this research, Roth has identified a cultural bias that finds Whiteness embedded as an initial default within technologies and products which have a sense of “flesh” as central to their design. Roth investigates this “colour complex” as she examines the racialized imagery and representations of skin colour as constructed and defended by manufacturers and marketers of seemingly innocent products. This material culture includes cameras and film chemistry, face detection/face recognition/face tracking cameras, children’s toys and art materials, fashion mannequins and beauty products, fleshtone underwear and hosiery, sun tan and sun block products, skin bleaching products, bandaids and prosthetics, and even video game software. Roth proposes her original concept of “cognitive equity” – this is a notion of cultural and racial equity that does not revolve around legislation, statistics and access to institutions, but rather is an intelligent strategy for creating and promoting equity by inscribing a wider dynamic-range or continuum of skin tones into common products, visual technologies, and design practices. With The Colour Balance Project, soon to be published as an e-book, Roth raises our awareness of these biases within mass-produced goods and mass media – and encourages us to move towards the development of cognitive equity and colour balance in our design choices and social practices. 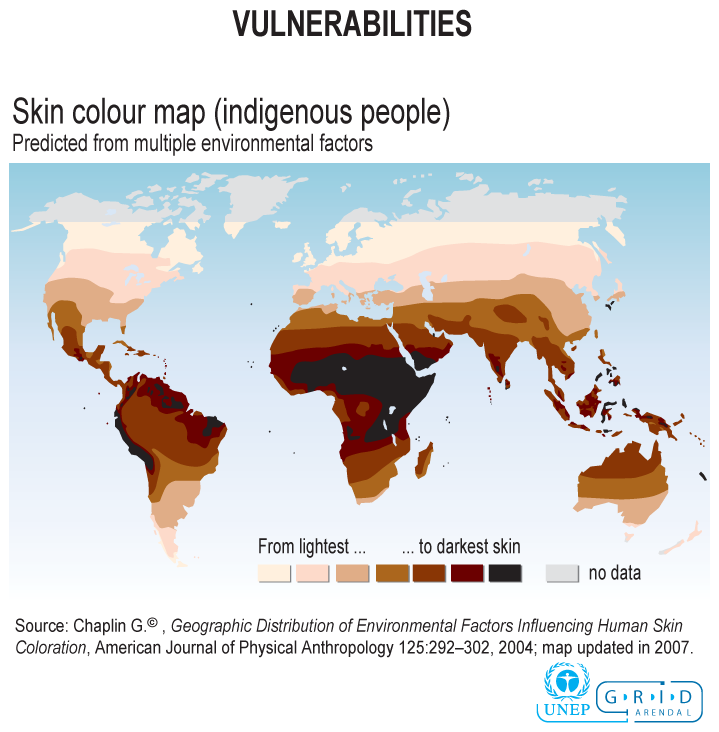 The colours of this website theme were drawn directly from the UNEP (United Nations Environment Program) map: “Vulnerabilities: Skin colour map (indigenous peoples): predicted from multiple environmental factors” on the GRID Arendal site. This map was authored by Emmanuelle Bournay, UNEP/GRID-Arendal, 2007. And, so, this map shows areas of colour based on latitude, environment and indigeneity without noting that, with diaspora and migrations, dark skinned people also live near the Poles, light skinned peoples also live near the Equator, and people of many colours of skin are gathered in large cosmopolitan cities around the world.